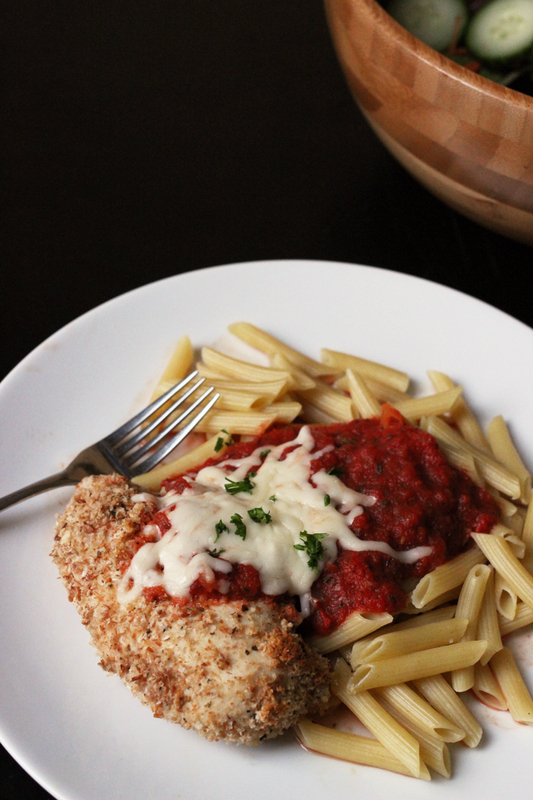 Chicken Parmesan is the ultimate date night dinner. In fact, it was what I served my husband on our very first date. 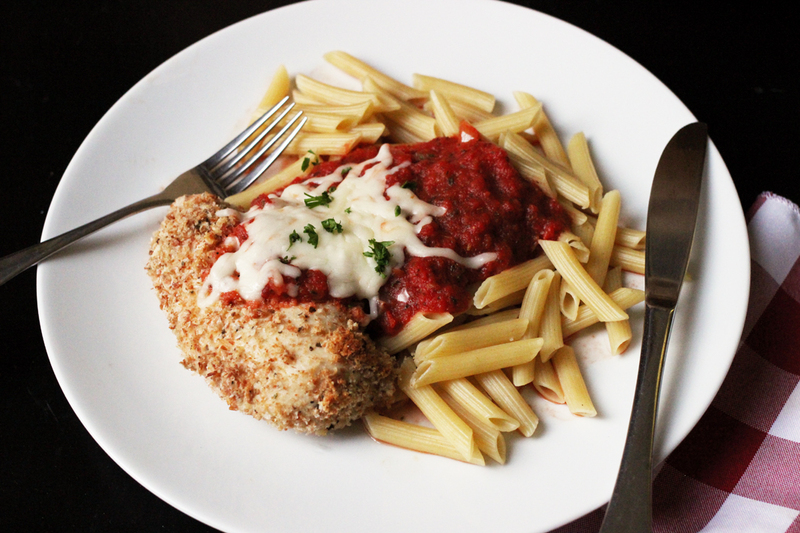 Give this Chicken Parmesan recipe a try: succulent, breaded chicken served aside pasta and a simple red sauce. Many, many moons ago… in fact, about 26 years ago, I made dinner for the man who later became my husband and the father of my children. Chicken Parmesan was the first meal I ever cooked for Bryan. The chicken turned out okay, but you should have seen the look on his face when I broke the spaghetti in two! That’s how we always did it in my family. Doesn’t everybody? Uh, no. True pasta connoisseurs do not break the spaghetti noodles in half. But, thankfully, he didn’t hold it against me. He married me anyway. And the rest, as they say, is history. For the last few years I’ve recreated that first date dinner for Valentine’s Day. We enjoy the meal with our kids and take a walk down Memory Lane. Over the years, I healthified just a tad. Instead of coating the chicken in eggs and white bread crumbs, I now use buttermilk, whole wheat bread crumbs, and non-stick cooking spray. Instead of frying it in oil, I bake the chicken. These adaptations result in an easier, more hands-free meal that is a little bit healthier for us. Stock up on ingredients when they are on sale. Instead of paying full price, buy more than you need when you see it on sale. Then you always have it when you want it. I do this with chicken and spices. Culture your own buttermilk. It’s so much cheaper once you get it going. I start a fresh batch with this culture, but then make repeated batches with a little of the last batch. Shop the stores that have the best prices. When I did my big grocery store showdown, I learned that ALDI and Costco have the best prices for a lot of the things I buy. I regularly stock up on chicken at ALDI now. Make your own bread crumbs. My youngest child doesn’t like to eat the crusts on her bread. It’s a hill I’ve chosen not to die on. She cuts off the crusts and adds them to a bag in the freezer. I do the same when I make tea sandwiches. Whenever I need bread crumbs, I whiz them up in the food processor. food processor or Vitamix — to make the breadcrumbs. sheet pans — Buying commercial pans was a game changer. parchment paper — because I don’t like dish washing. 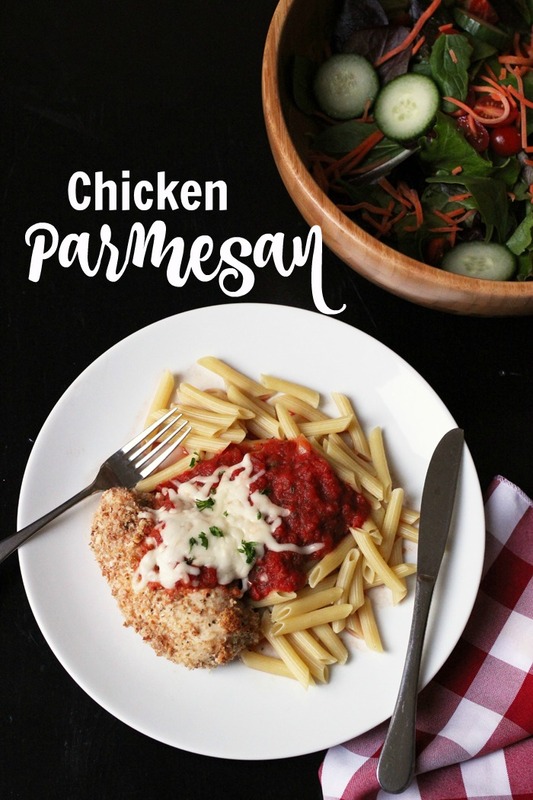 Give this Chicken Parmesan recipe a try: succulent, breaded chicken served aside pasta and a simple red sauce. It’s the ultimate date night dinner! Preheat the oven to 375 degrees. Line a rimmed sheet pan with parchment paper. In a shallow dish, combine the buttermilk, garlic powder, and black pepper. Place the chicken in the buttermilk, turning to coat. Allow to the chicken to marinate while you prepare the breading. In another shallow dish, combine the bread crumbs, salt, basil, and oregano. Remove the chicken pieces from the buttermilk marinade and dip in the bread crumb mixture, turning to coat all over. 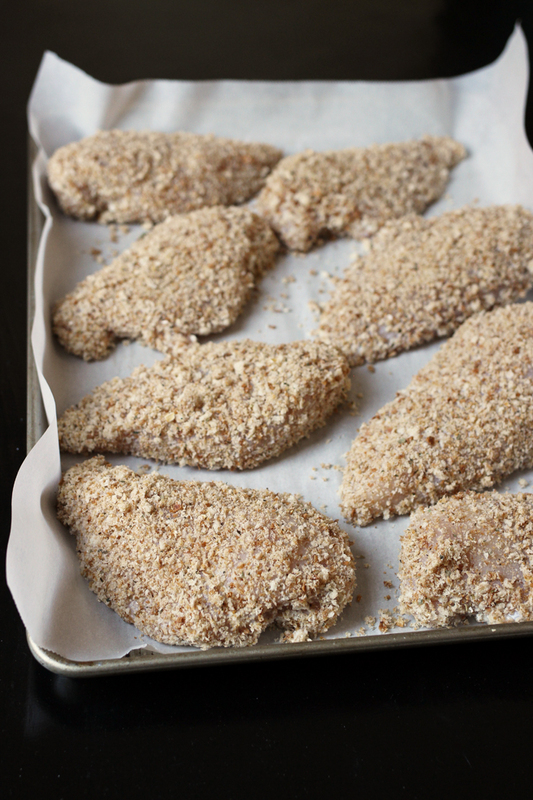 Place each breaded chicken piece on the prepared baking sheet and spray with nonstick spray. Bake the chicken for 20 to 25 minutes or until cooked through. Serve the chicken with the pasta, topping with marinara sauce and sprinkling on cheese to taste. Originally published February 15, 2010. Updated February 5, 2018. Can I prepare the chicken breasts up to the point where you dip them in the breadcrumbs and then freeze them until a later date to bake? Updating my reply: you can do so, though you may lose some crispiness in the breadcrumb texture. I love that the changes you made actually made it cheaper too! This is so funny, I think that Chicken Parmesan was one of the first dinners I made my husband when we were dating also. We love it and have it regularly. While I still saute my chicken in EVOO, I do use Dijon mustard sometimes instead of eggs or buttermilk. But I think I’ll give this one a try also. Thanks. As always, a huge fan of your site! I HAVE to try this soon! Thanks! We ended up trying out this recipe last night. I baked it on a cooling rack nestled on a cookie sheet. It worked out great! But we decided to saute the cooked breasts in olive oil and butter and bake in some sauce (topped with mozzarella!). It was super easy and super tasty! And yes, it was served with crockpot red sauce and spaghetti with a side salad. YUM! I made this for our Family Valentine’s Dinner last night and the family just couldn’t get enough of it. I like the fact that the chicken is baked and not fried. I did add some parmesaen cheese to bread crumb mixture. The house smelled so good while chicken was in the oven. I served it with noodles and Caesar salad and Malasada’s for dessert. @ray, yeah! How fun to hear. Hadn’t intended making chicken parm tonight but, guess what, that’s what we’re going to have tonight. It just sounded good! !